Slice the cucumber making either 48 rounds or squares. Shred your chicken with a food processor if you have one or using a fork. In a bowl thoroughly mix the chicken, mayo, cilantro, scallions and cumin and salt and pepper. 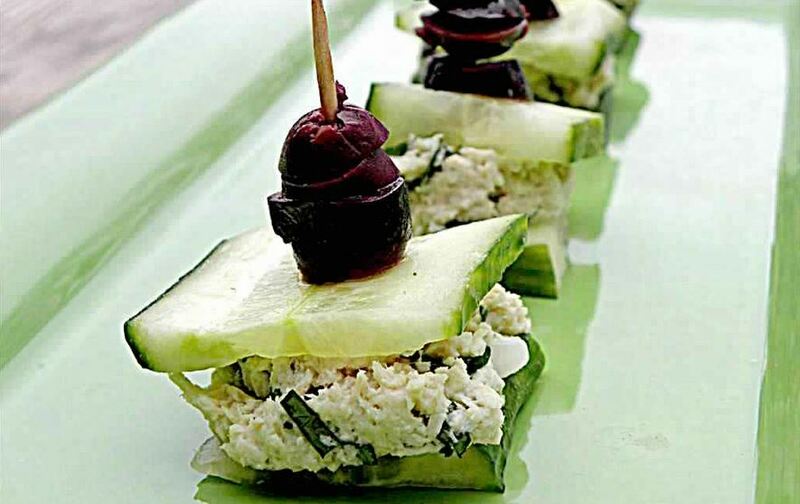 Lay a slice of cucumber on the plate you will serve the appetizer on. Add a heaping tablespoon of the chicken salad on the cucumber, lay another piece on top. Add a toothpick to hold it together. Place kalamata, black or green olives through the top of the toothpick to pretty it up!